This remembrance of January 12th 2010 pays tribute to the memory of the victims and commemorates the Haitian people’s resilience and resistance. The images of Haiti exhibited here celebrate the people and culture of Haiti, even during the first days and months after the earthquake. An estimated two hundred thousand people perished, many more were injured and maimed, and over a million people were made homeless. These dramatic images bring Haiti into the Cambridge Public Library, commemorating the lives lost in the devastating earthquake and recognizing the ongoing struggle of Haitian people against the injustice of domestic and international forces. Taken over four decades, the photographs reflect not only moments of profound tragedy, but also elements of our shared humanity: going about work, encountering spiritual worlds, sharing conversation, individual and communal dignity. As artists, we hope the images are mirrors of who we are—all human beings. We hope, too, that the images bear respectful witness to and proper respect for the Haitian people's great loss of life in the 2010 earthquake. This exhibit, and the opening program held on January 14th, 2017, address Haiti’s continuing struggles. Natural and un-natural disasters afflict the nation. The 2016 devastation of Hurricane Matthew in the southwestern part of the country is one of a series of catastrophes that highlight Haiti’s vulnerability to natural disasters due to poor and neglected infrastructure, inadequate preparation to crisis response by state authorities, and vast income inequality leading to lack of support for public services, such as health, sanitation, housing. In this sense Haiti’s persistent humanitarian crisis is fundamentally un-natural. People in the United States experienced the un-natural side of natural disaster and tragedy with the impact of Hurricane Katrina on New Orleans in 2005 and Hurricane Sandy in the Middle Atlantic in 2012. In those disasters social fault lines were as destructive—if not more so—than the geologic and atmospheric ones. 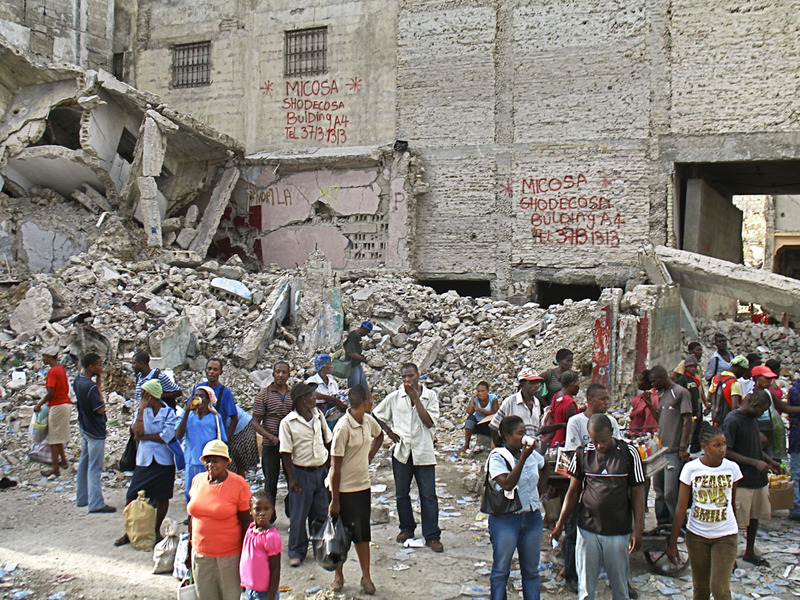 In the case of the 2010 in Haiti, bribes to government officials to ignore building codes led to shoddy construction, such as too much sand and too little cement in building concrete, which resulted in structures that collapsed much more quickly and extensively than they should have. Thus the painful effects of earthquakes or hurricanes linger for years. Shamefully for the organizations (including the Red Cross) that promised billions in international relief and recovery investment, little or nothing reaches the beleaguered streets and neighborhoods where people long to build a more just, secure, and healthy society. The descendants of the Haitian revolutionaries of 1791–1804, creators of the first Black republic, deserve better, and are steadfast in the continuing struggle. The current Poet Laureate of Boston Danielle Legros-Georges and Haitian poets and artists Jean-Dany Joachim, Patrick Sylvain, Tontongi, Fred Edson Lafortune, Lovel Cadet and Charlot Lucien participated in the opening reception of this exhibit. This event is sponsored by Trilingual Press/Tanbou, Haitian Artists Assembly of Massachusetts, City Night Readings, Echo Culture, EBCA Editions, the Union of Maine Visual Artists (Portland Chapter) and Duggal Visual Solutions.